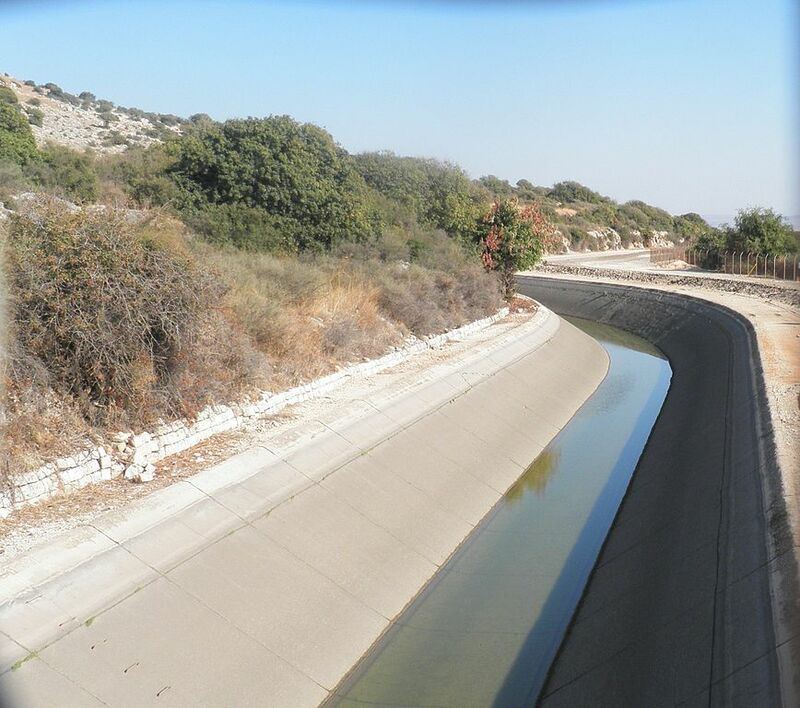 Water infrastructure in Israel is managed and developed by the government-owned company Mekorot. The company became Israel’s national water provider in the 1950s and soon began plans for the National Water Carrier. The National Water Carrier (NWC) is a system of pipes, canals and reservoirs that delivers water to most of Israel. The system is owned and managed by Mekorot. The NWC was established in 1964 and is Israel’s largest infrastructure project over the last 50 years. The construction plans were approved by the government in 1956, construction began in 1959 and the system was completed in 1964. The system carries water from Lake Kinneret and other water sources in the north to the southern part of the country and is about 130 km long (Fig. 7). The NWC also includes two pumping stations, one at Lake Kinneret and the other at the Zalmon reservoir. Additionally, there are water and sewage pipe systems in the northern and southern regions of the country, which are not considered part of the NWC but are still managed by Mekorot (Fig. 7). Figure 7. 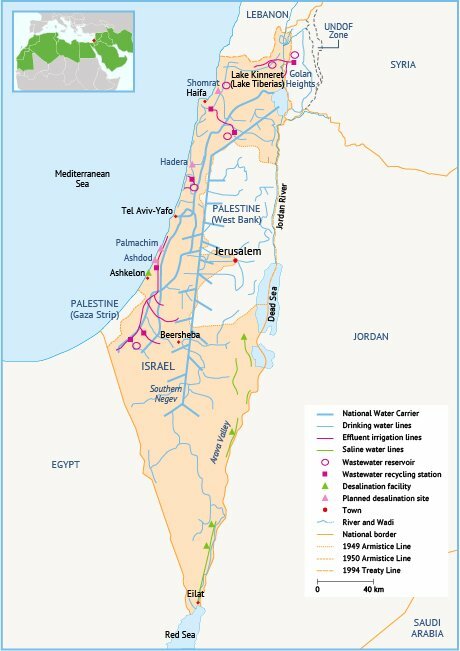 Israel’s national water infrastructure grid. Source: Fanack based on Tal, 2006. In 2012, the Water Authority published a master plan outlining a strategy to ensure water availability until 2050. While total water use is expected to rise from 2,131 MCM in 2010 to 3,571 MCM in 2050, natural water availability is expected to drop by 10-15% due to climate change. Israel will therefore need to manage consumption and increase production of alternative water sources such as desalination and treated wastewater. Increase desalination production to 700 MCM/yr by 2020 by developing seawater desalination plants as a primary water supply source. Plans include a desalination plant in the Western Galilee. The master plan also outlines construction of a desalination plant at Sorek, which became operational in 2013. Develop the national conveyance system for accommodation of desalinated water. This includes: developing a fifth water system to Jerusalem, developing the western and eastern Galilee regions as well as the southern and northern Sharon region, developing the master plan in the Negev and the Arava, developing the western water carrier and adapting regional systems to the upgrade. Increase average performance capacity of the water and sewage corporations. 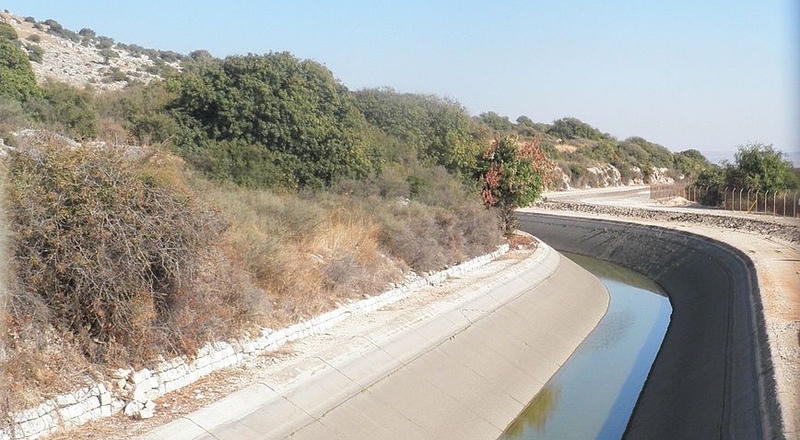 Advance projects to remove contaminants from the Coastal Aquifer in the area of Tel Aviv. 3. Developing or expanding seven wastewater treatment plants to tertiary level treatment. Additionally, the plan briefly mentions moving forward with the Red Sea-Dead Sea conduit, which will transfer water from the Red Sea to the Dead Sea in a bid to halt the decline of the Dead Sea. The project will also produce hydropower and desalinated water for use in urban centres in Israel and Jordan. Israel, Jordan and Palestine signed an agreement in December 2013 to implement the first phase of the project. However, critics are concerned about the environmental and economic impact of the project as well as its feasibility considering the geopolitical climate in the region. Israel’s National Water Carrier. Photo: Ariel Palmon. Mekorot, 2015. The National Water Carrier. EcoPeace Middle East, 2015. Red-Dead Conduit.